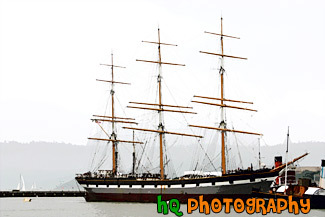 A scenic picture taken of a The Balclutha beautiful boat located in the San Francisco bay. This was taken on a cloudy day in the bay. The overall length of The Balclutha is 301 feet, length of deck is 256.5 feet, the beam is 38.6 feet, the depth is 22.7 feet, the gross tonnage is 1689, and the height of teh mainmast is 145 feet. In 1954 the San Francisco Maritime Museum purchased Pacific Queen (The Balclutha was renamed this when Frank Kissinger purchased it in 1933) for $25,000. Assisted by donations of cash, materials and labor from the local community, the Museum restored the vessel and returned her original name. The ship was transferred to the National Park Service in 1978, and Balclutha was designated a National Historic Landmark in 1985.